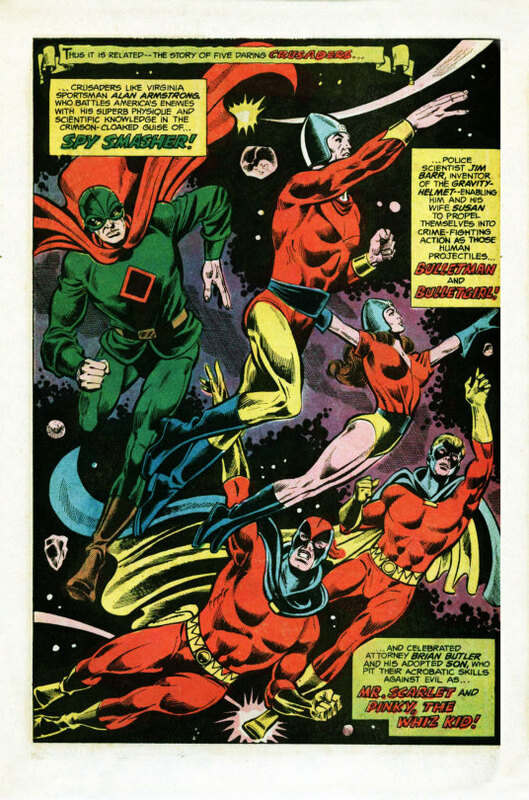 For whatever reason, after Len Wein did the Justice League/Justice Society crossover that brought back the Seven Soldiers of Victory, somebody–Julie Schwartz maybe–seemed to decide that it wasn’t enough to simply bring these two venerable teams together, there needed to be a third group. So this year, that group would be comprised of the heroes once published by Fawcett, Captain Marvel’s original home–described on this cover (though not inside) as Shazam’s Squadron of Justice. It must be said that fielding this many super heroes in one story made it difficult to give each player enough screen time, and also required menaces on a totally different scale. For this story, Schwartz brought in E. Nelson Bridwell to plot the story, as Bridwell had probably the best working knowledge of the Fawcett heroes, whose adventures he had read as a fan. Julie hedged his bets, though, by having one of his mainstays, Marty Pasko, dialogue the story. In any event, it was always an exciting thing to see a whole bevy of new super heroes–possibly why Schwartz went this route in the first place–and one or two of them i even already knew from the reprint of WHIZ COMICS #2 that DC had issues a few years previously. The villain of the piece is King Kull, the Beast-Man, an old enemy of the marvel Family. Here, he’s perfected a Torpor-Beam that freezes the gods and heroes of at the Rock of Eternity in time. The only one swift enough to escape is Mercury, and at the mental urging of SHAZAM, he journeys to Earth-1 and Earth-2 to assemble a team of heroes to thwart King Kull. Mercury only absconds with select heroes, though–he takes green Arrow but leaves Black Canary behind, for no adequately-explained reason. But hey, he’s a god, I’m sure he knows what he’s doing. 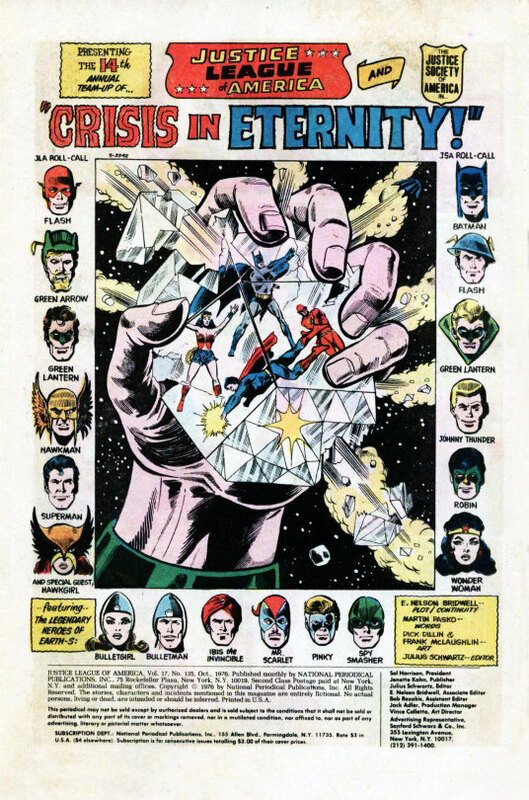 In addition to five Justice Leaguers and special guest Hawkgirl and six JSAers, including the Earth-2 Batman out of retirement for this caper, Mercury also brings together all of the other heroes of what is now labeled Earth-S (for SHAZAM, of course!) The JLA and JSA have no idea who these new guys are, so we get this nice splash image that recounts their stories and backgrounds–both for the readers and for the other heroes. 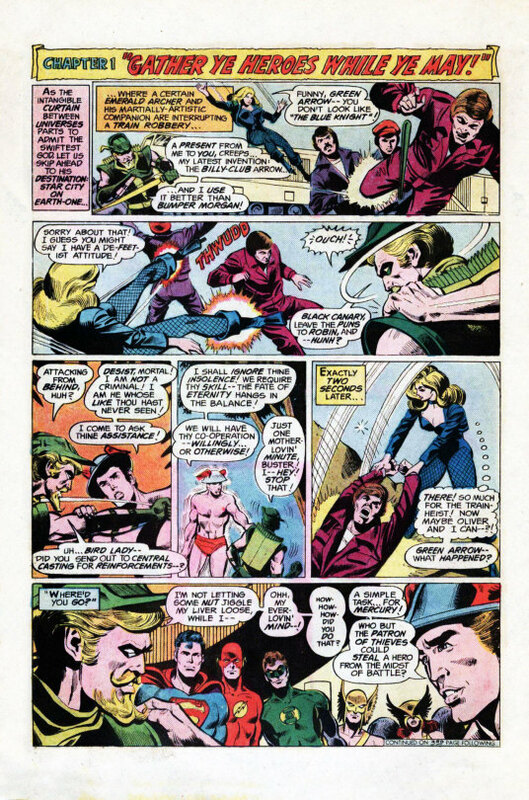 For reasons that are unclear, the assembled heroes split up into three groups and head out to three separate destinations–all except Johnny Thunder, to whom Mercury gives a special, secret mission. On Earth-2, Superman and the Earth-2 Wonder Woman journey to Atlantis, where they encounter Earth-2′s evil Queen Clea, who has teamed up for nebulous reasons with the Penguin and Blockbuster from Earth-1 and also IBAC from Earth-S to plunder Atlantis. 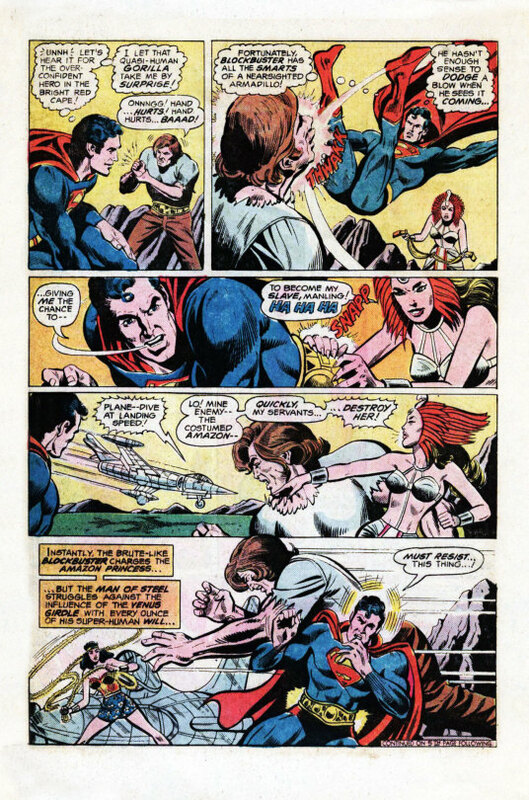 Despite being outnumbered, Superman and Wonder Woman lay into Clea and Blockbuster while penguin and IBAC take off on their own assignment for King Kull. IBAC and Penguin are assembling a device given to them by Clea that will supposedly allow her to enslave Atlantis. But just as they complete their work, they are set upon by to other heroes, Green Arrow and Spy Smasher from Earth-S. Green Arrow has no problem kicking the Penguin around, but Spy Smasher is seriously outmatched by IBAC until he’s able to get the villain to speak his own name, the magic word that transforms him back into harmless Stinky Printwhistle. But the device the two villains constructed has billowed forth a great cloud which, when it passes over a landmass, affects its density, causing it to sink beneath the waves. 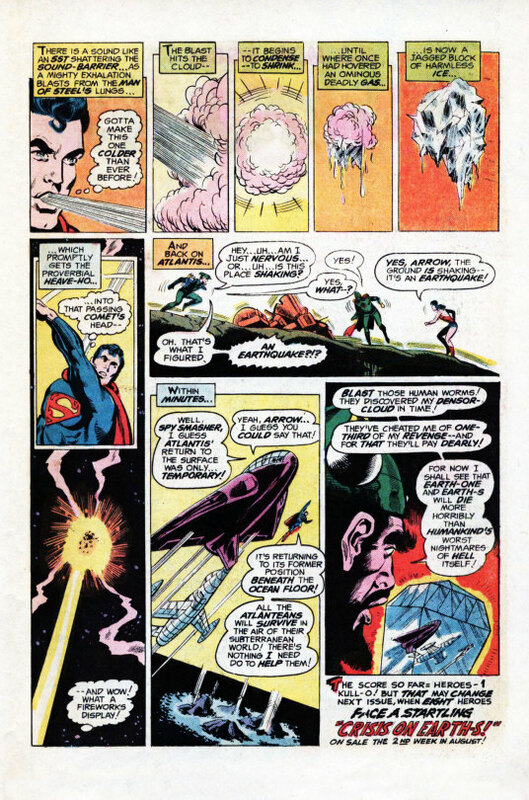 This is a problem–though not much of one for Superman, who in the space of less than a page freezes the cloud with his super-breath and hurls it into a passing comet, thus saving Earth-2. Elsewhere, King Kull fumes, but indicates that he can still have his revenge on Earths 1 and S–and that’s where things leave off this installment. 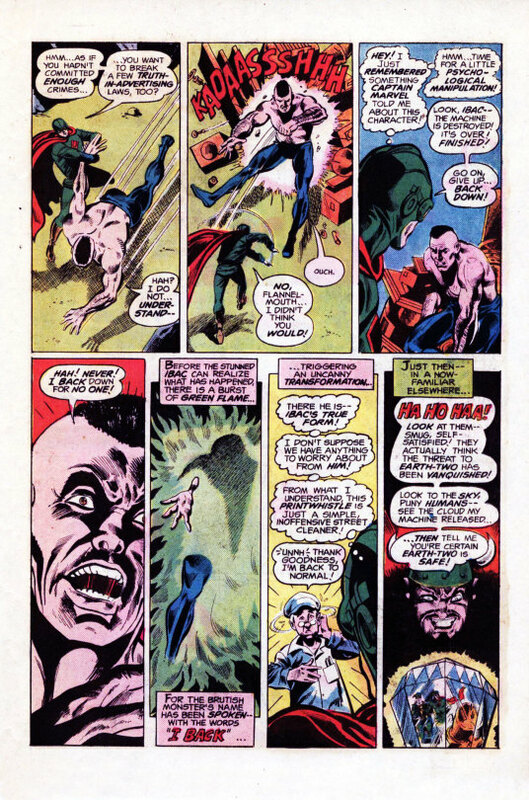 It’s a lot of fighting and explaining who characters are, but the plot mechanics don’t really make a whole lot of sense–why are Clea, penguin, Blockbuster and IBAC down with King Kull’s program and how did they all get brought together? Still, it was a fun issue.